The Striped scorpion, also known as the Devil’s scorpion, is the most widespread scorpion in the United States. It is often discovered co-habitating in large numbers, under flat stones near ponds; and in rock-strewn cattle pastures. The Striped scorpion is a smaller species of scorpion, measuring a total body length of 1 to 1.5 inches. This species has a powerful sting, that (often) results in pain comparable to that of a wasp; which lasts for several hours. As such, to ensure the safety of all occupants, homes with the elderly, small children and pets, should take pest control precautions; to prevent an invasion of the dwelling, structures and the surrounding property. In nature, a Striped scorpion will feed on worms, spiders, crickets, small invertebrates; and occasionally smaller members of their own species. Natural predators of the Striped scorpion include centipedes, grasshoppers, mice, and several species of snakes. They are variable in color and pattern. Specimens from Oklahoma and Kansas are darker with light orange striping. Specimens from West Texas tend to be more pale with lighter yellow striping. 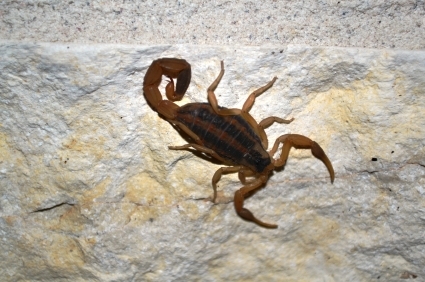 The Striped scorpion also has the ability to remain alive during extended periods of below freezing weather. Recent studies show that species capable of living through these conditions have a protein-like substance that allows them to survive by “trapping” ice crystals in their gut.